In a letter to the company’s CEO and Chairman, Google’s climate scientists have spoken out against the company’s financial support for Senator James Inhofe. 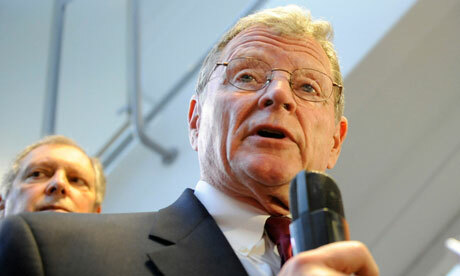 Inhofe is known for declaring climate change “a hoax on the American people”. Such comments have led Google’s climate scientists to question the company’s motivation for backing the Senator. Google has supported environmental science research since the formation of its Google Science Communication Fellows group in 2011. Google’s scientists are involved in climate change research and discussions with other scientific bodies, the US government and private sector. Despite the petition and internal letter, the fundraiser went ahead as planned. As well as receiving donations from Google, Inhofe has received strong political backing from oil and gas corporations in the past. Google management maintains that although it disagrees with Inhofe on climate policy, they nonetheless share interests in Oklahoma that have led to Google’s support of the Senator. The letter from Google’s scientists shows the effect of big money on business and politics in America. The American democratic system is defined by a one man one vote system but is increasingly in a position where only the rich and elite can afford to run for power and corporate interests hold more sway than environmental and individual needs. Google has earned its reputation as one of America’s most innovative and forward-thinking companies, and has shown climate leadership by improving its own environmental performance and investing in clean energy technologies. That’s why it was deeply troubling for us, as Google Science Communication Fellows, to learn about Google’s July 11, 2013 fundraiser supporting Oklahoma Senator James Inhofe’s 2014 re-election campaign. Among his most notorious statements, Senator Inhofe has outrageously claimed that climate change is "a hoax on the American people" and, in the absence of a shred of factual evidence, accused climate scientists of being "criminals." The reality that human activities are causing major disruptions to our global climate and that these disruptions pose serious risks to society is accepted by virtually every climate scientist and by the world’s leading scientific organizations. Yet for more than a decade, Senator Inhofe has attacked and demeaned the very scientists who have worked tirelessly to better understand the threat and to warn us of the risks posed to the environment, our communities, and our children. In the face of intensifying heat, rising seas and extreme weather, corporate leadership and private sector innovation will be essential to developing clean energy technologies and implementing more sustainable business practices. So too will be political dialogue, bipartisanship, and cooperation. That’s why we’re strongly supportive of the outreach efforts of former Republican Congressman Bob Inglis, who today leads the Conservative Climate Coalition. Yet sadly, over the past decade, the polarization and gridlock that has derailed efforts to address climate change owes much to Senator Inhofe, who by relentlessly attacking the scientific community has undermined efforts at cooperation and consensus building. But Inhofe's assault on the scientific community is not a difference in climate policy; it's a strategy designed to promote dysfunction and paralysis; to destroy the reputation of scientists and the legitimacy of their institutions; and to undermine our ability to find common ground. In 2011, as participants in Google’s science communication fellows program, we witnessed first hand the company’s unique culture. At its Mountain View headquarters, we were introduced to new communication technologies and strategies for effectively translating climate science to a broad audience. At the time, we were proud to be part of Google’s investment in science education; inspired by the creative, talented, and passionate people we met; and eager to apply new tools and strategies in our public outreach activities. But Google’s recent support for Senator Inhofe forces us to question the company’s commitment to science communication and to addressing climate change. Nearly every large company must – and should – work with policymakers on both sides of the aisle. We also recognize the difficulty that corporations sometimes face in reconciling their core principles with their short-term business priorities. But in the face of urgent threats like climate change, there are times where companies like Google must display moral leadership and carefully evaluate their political bedfellows. Google’s support of Senator James Inhofe’s re-election campaign is one of those moments. Matthew C. Nisbet, Associate Professor, School of Communication, American University, Washington D.C. Note: Affiliations are for identification purposes only and do not imply endorsement by an individual’s institution or organization.